EU redrawing international borders through Western Sahara trade deal? WSRW has asked the EU Commission to clarify how the application of its proposed trade deal for Western Sahara to only the Moroccan-occupied part of the territory, is in line with its duty to respect territorial integrity. As the European Parliament is assessing whether or not to support the extension of the EU-Morocco trade deal into Western Sahara, more and more questions keep emerging. Western Sahara Resource Watch (WSRW) has sent several questions to the Directorate-General for Taxation and Customs of the European Commission (DG TAXUD), which had the lead in negotiating the Western Sahara trade deal with Morocco - the North-African kingdom that holds two-thirds of Western Sahara under military control since 1975. The questions concern the territorial application of the proposed agreement, which appears to be limited to the part of Western Sahara that is under Moroccan occupation. At the same time, the EU has a duty under international law to respect the principle of territorial integrity. Find WSRW's questions to DG TAXUD in the letter below (or download). 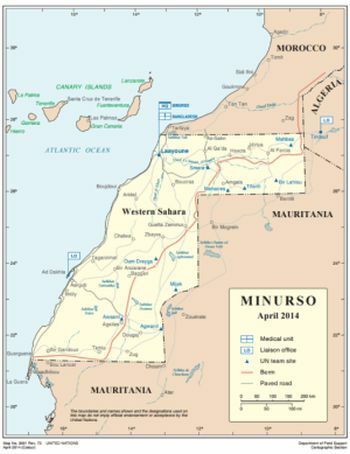 The photo to the right shows the map that is on the website of MINURSO, the UN Mission for the Referendum in Western Sahara. The red line depicts the wall built by the Moroccan army during the years of war. This military fortified sand-wall, often called the Berm, is 2,700km long and home to a reported 100,000 Moroccan soldiers and the world's densest minefields. Click the photo to get a larger resolution map, or download the map from MINURSO's page here. "We consider it important to have swift clarifications from the Commission, so that Members of the European Parliament (MEPs) can make an informed decision. It would be as if the EU would negotiate a trade deal with New Zealand for Australia and only apply it to Tasmania. Signing an agreement with Morocco covering Western Sahara without the permission of the Saharawis is clearly in violation of the EU- and international law in the first place, but so is promoting border changes or the partitioning of a territory, merely for the sake of a trade deal", says Sara Eyckmans of Western Sahara Resource Watch. "If the argument is development of the territory, then why should that be limited to the part that is under Moroccan occupation? Odd for a party that claims to be neutral in the conflict." Western Sahara Resource Watch is privileged to write to you. We wish to express our concerns about, and ask for your clarifications regarding, the territorial coverage of the proposed amendments to Protocols 1 and 4 to the Euro-Mediterranean Agreement establishing an Association between the European Communities and their Member States, of the one part, and the Kingdom of Morocco, on the other part. 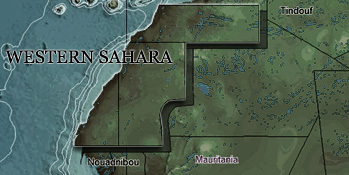 As is reported in the Commission’s own Staff Working Document, Western Sahara is a divided territory: during the years of war, the Moroccan army undertook to construct a 2700km long wall that runs from the Moroccan-Western Sahara border southward across the territory, and into Mauritania. Today, that wall - where reportedly 100,000 Moroccan soldiers are stationed and which are effectively surrounded by the world’s densest mine-fields - continues to split the territory in two parts: about two-thirds of the territory are controlled by Morocco, while the remaining third is under control of the Front Polisario. 1. Can you confirm that the proposed amendment to the EU-Morocco Association Agreement does not cover the part of Western Sahara that is outside of Morocco’s control or goods originated therein? 2. If so, how does the agreement comply with the EU’s Treaty-based obligation to respect international law, of which the respect for the principle of territorial integrity is an integral component? 3. Is there a precedent for an EU agreement with a third territory that has only partial territorial coverage? 4. What is foreseen in order to allow EU trade with and in the part of Western Sahara that is under control of the Front Polisario? 5. How will you ensure that the agreement does not discriminate against the population living in the part of Western Sahara that is outside the coverage of the agreement? 6. How does the European Commission assess the partial coverage of the agreement to be in line with its stated commitment not to prejudice the status of the territory or the UN peace process, when in practice it will effectively reinforce the division of the territory through contributing to the development of only one part? We would be grateful for your swift reply, as clarifications on this issue seems fundamental and urgent in order to ensure an open and transparent public debate over the Commission’s proposal and to allow Members of the European Parliament to make informed decision when they will vote on the proposal.